Stormhoek have been stirring up a lot of publicity through their blogging. They sent some free bottles to bloggers (people who keep a public diary on the internet) and received newspaper inches galore discussing their revolutionary marketing in return . So I picked up a bottle of the winning 2005 vintage at the supermarket. It is closed with a screwcap (hooray) and has a 'freshness indicator' on the back label saying that it should be consumed before January 2008. This wine definitely isn't the same one that I tasted at the wine show. No faults here. There are some lovely rich ripe berry fruits, some spice, medium finish. This is a wonderfully drinkable wine. Interestingly, the Stormhoek blog says this 2005 vintage was made for the US market and "Unfortunately for our friends elswhere, it’s only available in the USA". Well, it's in the UK Waitrose supermarkets at £5.99 ($11.50). A Pinotage is the very first wine to come from the brand new South Africa wine region of KwaZulu-Natal , far north of the Cape winelands. 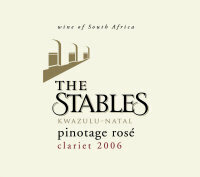 The Stables Pinotage Rosé is the first wine to be certified from outside the Cape and bears the Wine of Origin KwaZulu Natal appellation which had to be created especially before the wine could receive certification. The Stables Wine Estate, owned by Tiny and Judy van Niekerk, made the wine from grapes grown in nearby Greytown. Their own vines, which were planted in 1995, are expected to be ready for production in 1998. "This Pinotage Clariet has been produced from the finest KZN grapes. After 6 months of skin contact the free-run juice was barrel fermented in 2nd fill French oak barrels, which has brought out its elegant ruby colour and allowed for the alluring aromas of strawberries and cherries to develop. The wine is crisp and refreshing, packed with fruity flavours and finishes off with soft butterscotch and caramel. 12.5 % abv, price 65 ZAR." There is some great Pinotage being made in New Zealand, although unfortunately little is exported. New Zealander Sue Courtney writes that "Pinotage, the South African grape variety, was introduced into New Zealand by pioneering winemaker, Corbans, who ....... planted the first Pinotage vineyard at Whenuapai on the northern outskirts of Auckland, and the first wine was made in 1964. "The variety was quick to catch on with the handful of winemakers, especially those in Auckland, for the thick skins of the grapes were able to stand up to the region's humidity as well as offering resistance to diseases. "However, the quality of the early wines was variable. "Now, since the late 1990's, Pinotage has been undergoing a revival with new clones, developed in South Africa, becoming available. The grape is grown in most regions, from the most northerly to the most southern vineyards, although in tiny quantities at the southern extremes. And there are some very good examples indeed." 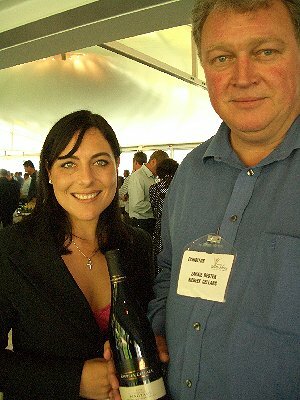 Therese Swart (pictured right) is holding a bottle of her new Signatures of Doolhof Pinotage. 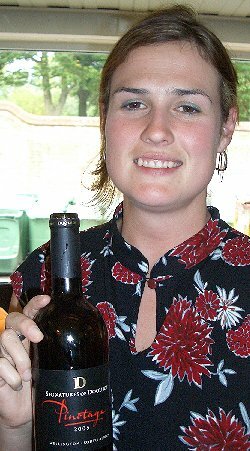 Therese is the head winemaker at Doolhof Estate, a new winery in Wellington. "We're in a valley between two mountains," she told me. 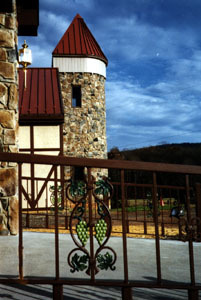 "Our vineyards are planted at different heights and aspects -- they're very different. That is our signature." 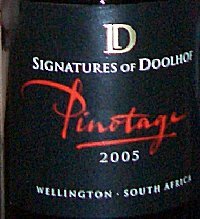 The 2005 Signatures of Doolhof Pinotage was very dark with a red rim. It had the most attractive sweet upfront fruit followed by a depth of red berry flavours and some intriguing coffee tones. Therese said the wine had been aged almost a year in 80% French/10% American oak barrels of which 70% were new. Doolhof means labyrinth, and wine grapes were first planted in the valley in 1728 until devastated by phylloxera in the 1890’s. One hundred years later in 1995, Doonhof Estate planted their first vineyards to Bordeaux varieties, plus Shiraz, Chardonnay and Pinotage. 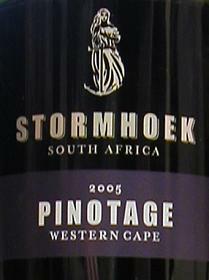 Previously the farm sold its grapes to other wineries, but they wanted to make their own wines and this 2005 Pinotage is one of their first offerings. Now they have built their own facilities on the farm and registered as an Estate in 2005. Although a name new to me, Doolhof have already enjoyed success in international competitions, including a Gold at the 2007 Michelangelo International Wine Awards for the 2005 Signatures Pinotage and a Double Gold at Veritas 2006 for the 2006 Signatures Sauvignon Blanc. Therese Swart took up her position as Head Winemaker & Director of Wine at Doolhof in 2004. Previously she was making wine for Groot Constantia Estate which she joined after studying wine making at The University of Stellenbosch. I was really impressed with my first taste of Doolhof’s wine and look forward to enjoying a bottle with dinner. This is a winery of which we will be hearing a lot more, and one I intend visiting in February when I am next in the Cape. "This is a red wine associated almost exclusively with South Africa, where, in 1925, Cinsault, a simple red grape of the Rhone Valley of France, was crossed with Pinot Noir to create Pinotage. Generally speaking, it is a rather simple and rustic red but I have also sampled wines that show more of the Pinot round texture and, in fact, my first experience back in the early 1990s was with Kanonkop, which paired up pretty well with swordfish, of all things. More recently I found enough textural finesse in the Golden Kahn bottling, which got along just fine with pork. I've probably been exposed to less than a dozen takes on Pinotage but clearly my favorite to date, one that delivers more depth and flesh and makes a delicious blueberry and sweet oak statement, is the Simonsig Stellenbosch Red Hill 2003 ($28)." 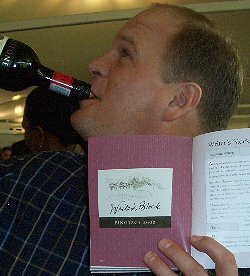 I'd agree with him on Simonsig Redhill, and also Pinotage matching well with swordfish. I recall myself how well Wamakersvallei 'La Cave' worked with fish in Stellenbosch's Fish Market restaurant. Read George's full article here . This delicious Pinotage from Flagstone is currently available from the winery discounted by 33%. The 2004 which usually costs 149 ZAR can be had for just 98 ZAR. Owner/winemaker Jack Bruce says of this wine "This is classic Flagstone Writer's Block - more Pinot Noir than Pinotage. Redolent, vibrant red with purple edges. Intense, concentrated aromas of wild blueberry and ripe cherry supported by a background frame of subtle oak aromas. On the palate the wine is ripe and generous with a core of black berry, preserved plum and youngberry. Match with Springbok Loin, Ostrich with Madagascan Pepper Sauce and Char Grilled Steak with Sweet Potato Chips." And if you want the background on how Writer's Block got its name -- the story behind that label is in my book "Marilyn Merlot and the Naked Grape." -- pictured above right with Bruce Jack.